The story is simple: some time in April 2002 my tach died when I was accelerating my 87GT on the highway. The RPM redlined and then dropped to zero. My gut feeling told me it was my tach filter, and after replacing it with the one from my 85GT, my suspicion turned into certainty. Nothing is easier than getting a new tach filter, right? Wrong! The tach filter has been discontinued from GM for some time, and the only alternatives were getting one from Rodney Dickman or making one yourself. Both alternatives were not really appealing, since Rodney's version at the time did not look stock, and making one myself would have probably looked even worse. Well, I've had these schematics on my site for years. But I never knew if these values were correct, or what the internals of my tach filter really looked like. Maybe the old one was repairable? A quick check revealed that there was no resistance from input to output. Disassembly time! Inside the can there is another metal can (5) that has the solder contact on one end. this contact touches the actual inner can. Inside this can is a cardboard isolation cylinder (6) to keep the internals from touching the inner cylinder's walls. 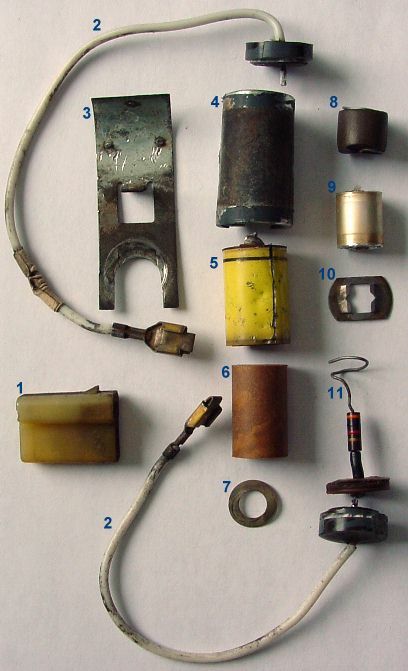 Anyway, Inside that can is a 10k resistor (8), which is inside something that probably used to be foam (8). Both ends of the resistor are curled up. One end touches a little metal spring (7), the other end touches the capacitor (9). The capacitor is wrapped around a 3k resistor (11), and the 3k resistor's end is isolated from the capacitor and soldered to the other solder cap. The unsoldered end of the 3k resistor was also curled up on top of the capacitor, and made contact with the capacitor and the 10k resistor. Finally, the other end of the capacitor made contact with a little spring (10) that extended past the contact cap to the outer cylinder. Measuring the capacitor showed that the value is 47nF. So the schematics have been correct all these years. But why did this unit fail? Well, nothing is soldered inside of it! All components just touch, and vibration, oxidation and aging do the rest. Can you fix it? Well, it depends. To get to the internals, you have to destroy the outer cylinder. After that, you can disassemble the internals, and probably restore contact by soldering some connections. But you won't be able to restore the original look. Rodney now offers a replacement tach filter that does look stock, but it is a bit pricey. At least there is an alternative now, and a NOS unit (if you can find one) won't be less, and will have oxidized on the shelf as well. Oh, if you have accidentally taken the tach filter apart, the image of the connector may come in handy, and the longer one of the two wires is the input (coil end), the shorter one is the output (tach end).